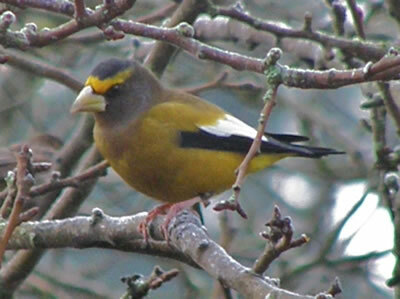 Welcome to February's issue of the Dereila Nature Inn newsletter. 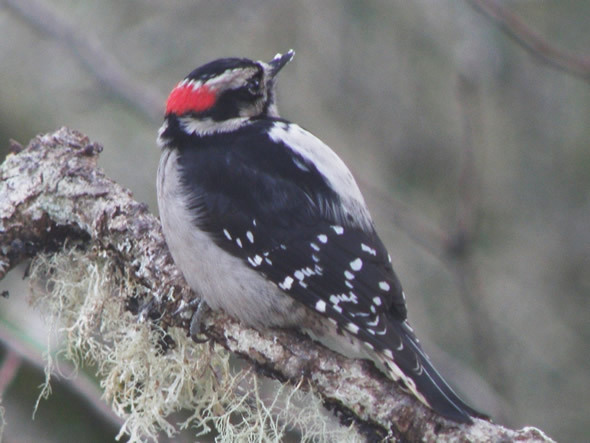 Showing off his red patch, a male Downy Woodpecker welcomes you this month. Like many of us in the Northern Hemisphere he's waiting for the return of spring. Hello everyone! Welcome to the latest issue of Whispers, the newsletter of the Dereila Nature Inn - your virtual nature centre. As we move into February we know that spring can't be far away which is a relief as it has been a very challenging winter for many of us this year. This month we have lots for you to enjoy with great photos, trivia and even a joke about a couple of moose on an outing. Thank you so much for subscribing and we hope you enjoy this issue. Which porous animal lives on rocks on the sea bed? Here is a selection of the many plants rely on others in order to survive. This month we have a terrific selection of nature photographs that have been sent in. 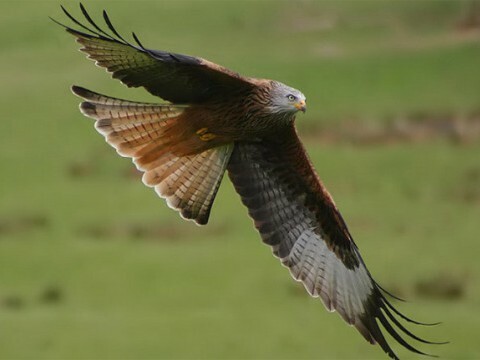 This spectacular Red Kite was captured in flight by Eileen of West Lothian, Scotland. 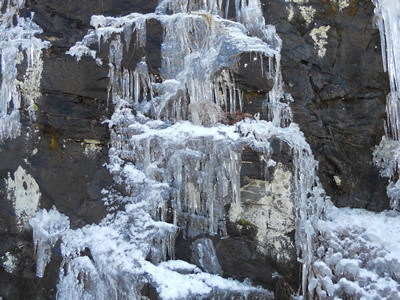 This frozen waterfall was spotted by Jonathan Schnurr, Suwanee, Georgia. 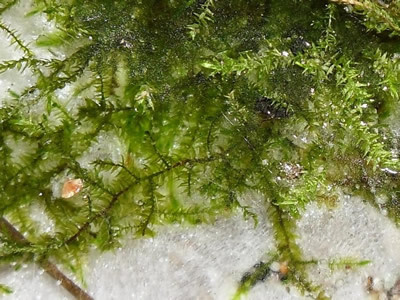 Jonathan also sent in a second winter shot: frozen moss in ice. 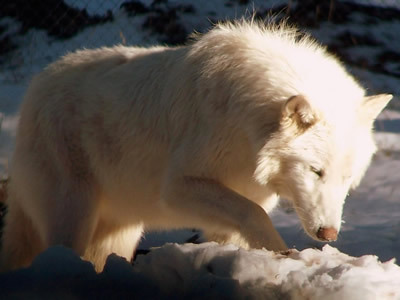 Chino Valley, Arizona, took this lovely picture of a White Wolf. 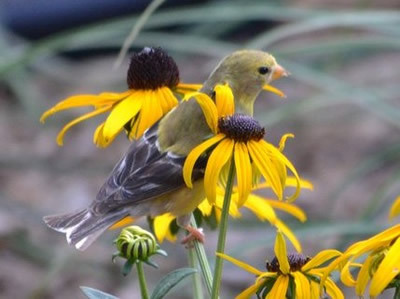 colourful scene of an American Goldfinch. We really appreciate you sending us these photographs for us all to enjoy. 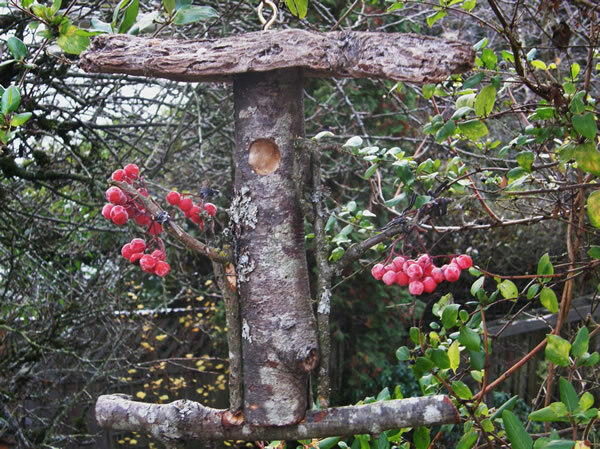 Want to make an interesting bird feeder or bird house? We have lots and lots of creative projects, tips and ideas on this month's highlighted page which we call Tips and Tricks for The Backyard Birder. You can visit the page by clicking here. This month we wander around under the Hawaiian sunshine. 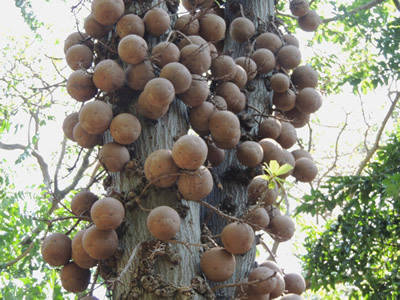 This is a Cannonball Tree, Couroupita guianensis, and it's really easy to see how this tree got its name. Is is native to the rain forests of South and Central America. 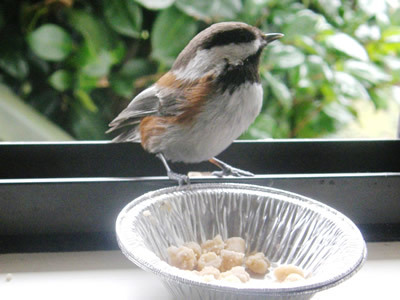 What do you think would be a great caption for this photo of a Chestnut-backed Chickadee at the kitchen window? As usual, we've given you a couple of ideas to help get you thinking. Number one: "It's so kind of you to do this for me." Number two: "Thank goodness there's some left. I've come a long way for this." 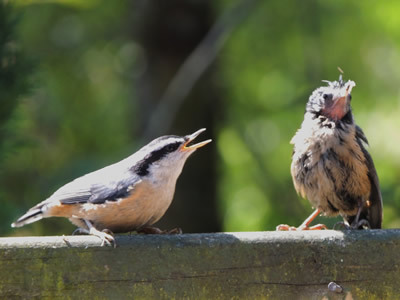 "If you insist on a punk hairdo like your friends, you can move out of my nest! 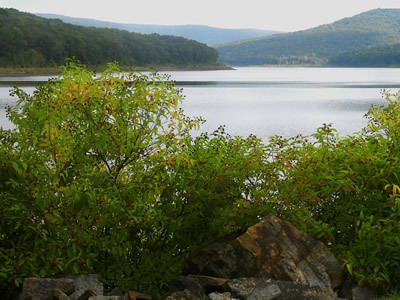 comes to us from Joyce Cahill of Winslow, Arkansas. 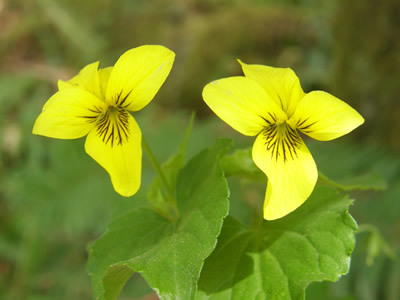 Yellow Wood Violet, Viola glabella, is sometimes called Smooth Violet or Steam Violet because it has smooth leaves and is often found along streams or in moist woods. The genus name, Viola, comes from the Latin word violaceous, a reference to the colour violet as many plants in this family are purple, blue or violet but as you can see, violets come in other colours, too. The species name, glabella, is Latin meaning "smooth-skinned" referring to the smooth leaves. 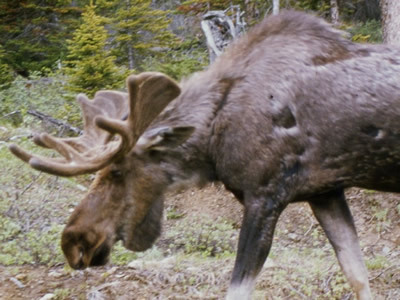 A moose explained to his buddy that he had a great little motor home. "Can we go for a ride?" his friend asked. So off they went. After a while they approached a bridge and the moose stopped suddenly. "What's wrong?" his companion asked. "The sign says 'only 11 feet high' and my motor home is 12 feet 6 inches." His friends replied, "Oh, don't worry about that. There are no police around, put your foot down and go for it!" "I should never have listened to him!" We are very excited because coming up on April 1 is the beginning of our Nest Box Festival and now is the time to start getting ready! 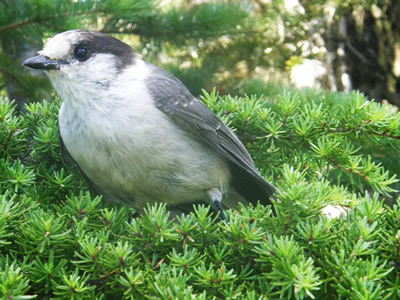 We encourage everyone to help the birds out a bit and put up a nest box or two then submit photographs of the birds and their boxes. 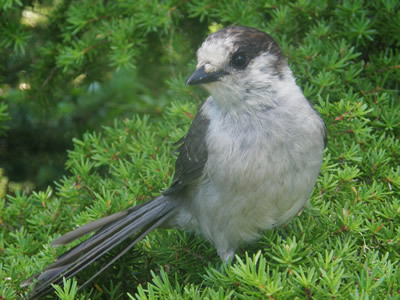 For more information, please check out our Bird Nest Box Festival page. 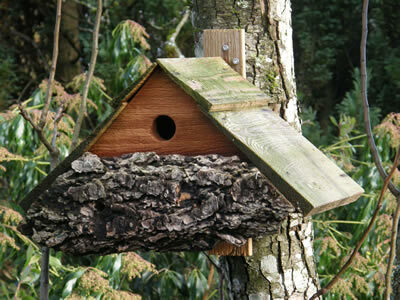 You will also find some ideas for making nest boxes by clicking here. 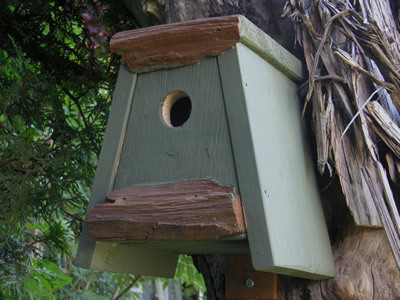 Speaking of nest boxes, now is a good time to clean out any nest boxes used last year and prepare them for this year. Use a pair of gloves to remove any old nesting material as insects may have settled in during the winter. 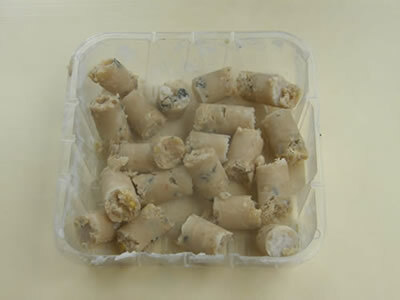 If there is mold in the box, give it a good scrub with a mild detergent and rinse thoroughly. 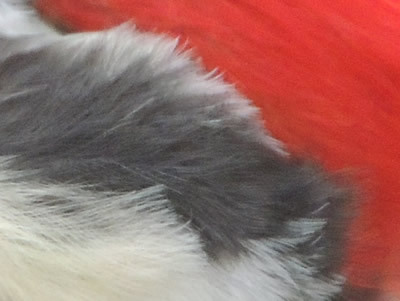 get that perfect bird photograph. You can see how to make them here. will soon gather round to see what's happening. Now's the time to get some great photos. which runs from February 14-17 this year. Click here for more details. (Canadians will be celebrating in April). Click here for more details. 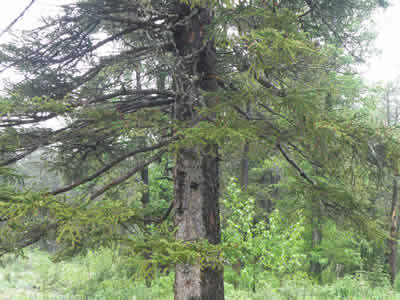 World Forestry Day will celebrated on March 21. 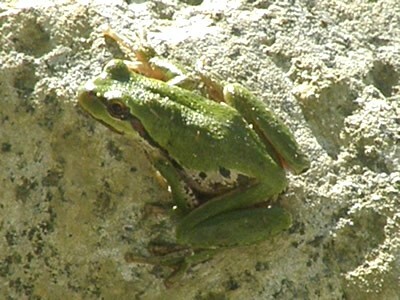 Did you know that frogs and toads shed the outer layer of their skin many times a year? 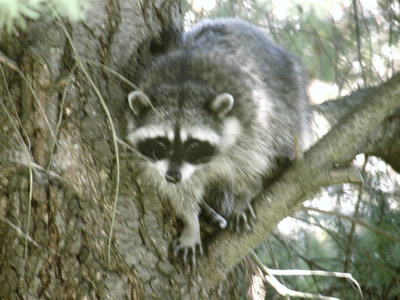 The state of Oklahoma selected the cheeky raccoon as its official state furbearing animal in 1989, although its official state mammal is the American Bison. 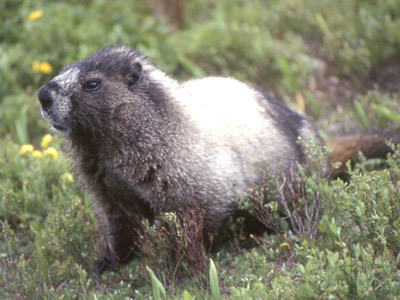 To see our collection of provincial and state mammals click here. Sponges are marine animals that filter food out of the water that flows through their bodies. 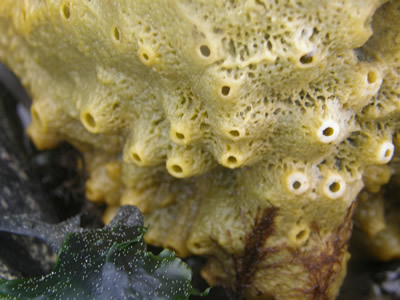 This is a Yellow-green Encrusting Sponge, Halichondria panacea. 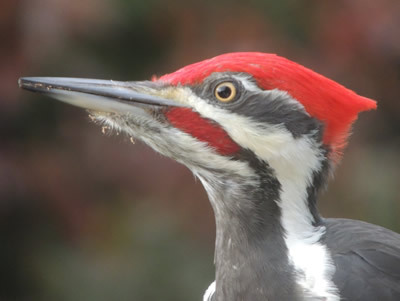 This month's mystery photo is a striking Pileated Woodpecker. We hope you'll watch for the next issue of Whispers in your inbox in March. See you then!